Planning a party, wedding, or special event in or around Fort Lauderdale? Great! We carry a wide selection of tables and chairs for rent in Ft Lauderdale, FL and surrounding areas. 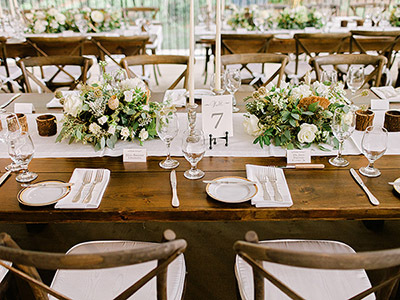 Whether you're looking for budget-friendly party chairs, affordable event chairs, or show-stopping wedding chairs for rent, you can be sure to find the perfect chairs and tables with Allure! Our selection of rental wedding tables and chairs include ceremony chairs, folding chairs, chiavari chairs, ghost chairs, vineyard (cross back) chairs, bride & groom chairs, sweetheart tables, round table rentals, guest tables, banquet tables, and bar stools. 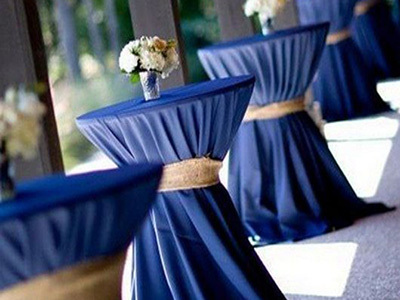 No matter the budget or decor, our event experts can recommend the perfect tables and chairs for your wedding! Our most popular tables for weddings are 60" round and 8' rectangular tables, paired with the always beautiful chiavari chair! The most popular choice for ceremony chairs? That would be our padded folding chair rentals, available in White, Black, Mahogany, and Natural. What type of party are you hosting? Our party rental table and chair selection includes affordable plastic folding chairs and high-end specialty chairs for rent. We also carry cocktail tables, guest seating tables, and buffet tables in various sizes to accommodate your guest list! We also don't require a minimum order to be placed, so if you're having a small get-together and only need a few chairs and tables, you're welcome to pick up the items from our warehouse in Fort Lauderdale! No time for pick up? Our crews can deliver your rental tables and cahirs as long as the order meets the minimum for delivery. Not sure which tables and chairs to rent? 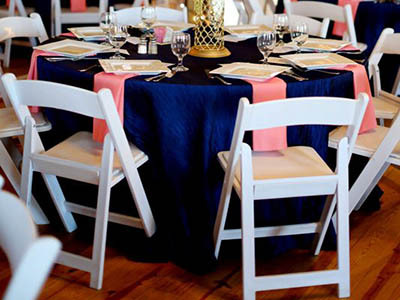 Here are some helpful tips for our most popular table rentals and chair rentals! Our most popular chair to rent is the Chiavari Chair. Chiavari chairs are well-known for their classic design. 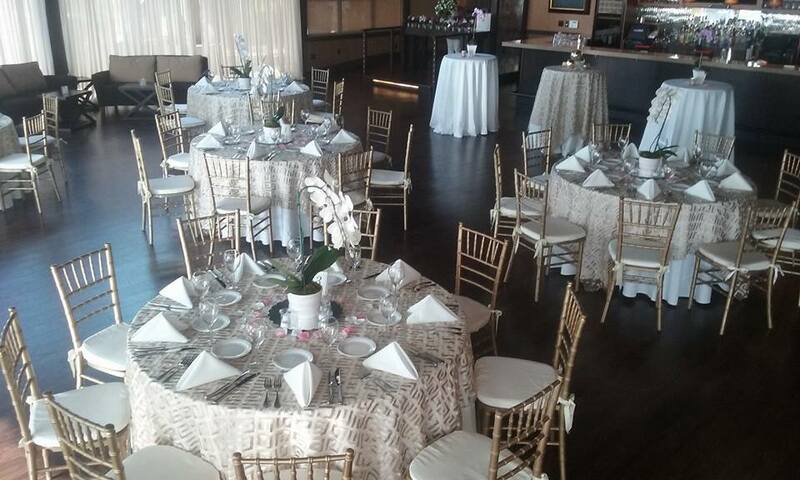 The chiavari chair rentals are available in many colors including Gold, Silver, Black, White, Mahogany, Lucite (Clear), and White Wash (Lime Wash). You can also accessorize with your favorite color cushion! Included with the rental are a variety of colors including white, black, ivory, gold, and silver. Allure Party Rentals also carries specialty colors too including plum, navy, royal, red, maize, tiffany blue (aqua), burgundy, and many more! For an affordable, practical, and good quality chair rental, we recommend our padded folding chairs. Padded folding chair rentals are very popular for outdoor events including beach weddings. These chairs for rent are available in White, Black, Mahogany, and Natural Wood. Our most common table rentals are 60 inch round, 72 inch round, 8 foot rectangular, and 6 foot rectangular tables. 60in tables seat 8-10 chairs comfortably, using a 120" linen. 72in tables seat 10-12 chairs, using a 132" linen. 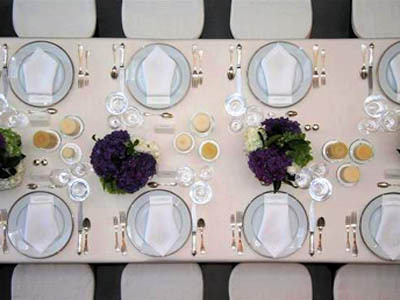 8' rectangular tables seat 8-10 chairs, using a 90" x 156" linen, however, these are also popular for food tables, gift tables, or desert tables. 6' tables seat 6-8 chairs, using a 90" x 132" linen, or you can also use these for buffet tables. You can also combine multiple rectangular tables to create one long guest table, popular for family-style events. Call us today at (954) 598-9595, send an email to info@allurepartyrentals, or stop by our Fort Lauderdale showroom at 1326 W McNab Road, Fort Lauderdale, FL 33309 today for a free table and chair rental quote! Our event experts are ready to answer your questions and recommend the best rental chairs and tables for your event!